The various hydrogen species present in a series of synthetic hydroniumjarosite ((H3O)Fe3(SO4)2(OH)6), and ammonioalunite ((NH4)Al3(SO4)2(OH)6) as well synthetic potassium (Cr3+ and V3+) and hydronium (V3+, Cr3+, and Ga3+) analogues were identified and quantified by 1H and 2H MAS NMR spectroscopy. The results confirm the defect mechanism proposed for alunite Nielsen et al. (Am Miner 92: 587–597, 2007), and allow for identification and quantification of even a few percent structural defects. For the paramagnetic samples, the isotropic shift for G2-OH group (V3+, Cr3+, and Fe3+) span more than 1100 ppm, which is related to different d-electron configuration (d2, d3, and d5). Analysis of the 1H and 27Al MAS NMR spectra shows that the synthetic ammonioalunite contains small amounts (5–10%) of hydronium. Furthermore, the close structural relationship between of hydronium and gallium alunite is reflected by the 27Al and 71Ga quadrupole coupling parameters. 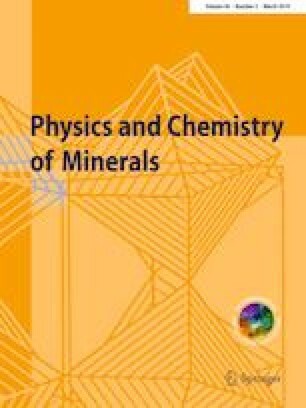 Thus, the current work demonstrates the applicability of solid state NMR spectroscopy for identification and quantification of hydrogen species in both dia- and paramagnetic minerals. The online version of this article ( https://doi.org/10.1007/s00269-018-1004-8) contains supplementary material, which is available to authorized users. Associate professor Dorthe B. Ravnsbæk, University of Southern Denmark is thank for valuable discussions regarding analysis of the PXRD data. EG acknowledges Oticon for a M.Sc. fellowship. UGN is grateful for financial support from the L’Oréal-UNESCO for Women in Science and a Villum Young Investigator fellowship (Villum Foundation, VKR022364). High-Field NMR studies were performed at EMSL, a DOE Office of Science User Facility sponsored by the Office of Biological and Environmental Research and located at Pacific Northwest National Laboratory.